Approximately 3 million children in Ethiopia are deprived of basic education, and almost 50% of youth is unemployed. By expanding educational opportunities for some of the most vulnerable children and youth in Ethiopia, we are working to change this reality. 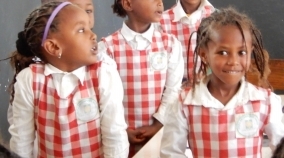 ETHIOPIAID’S AIM: Expand educational opportunities for marginalized women, youth and disadvantaged children. Since 1997, Ethiopia has made great strides in promoting universal education but many challenges remain. More than 25% of children who enroll in first grade drop out before they complete their first school year. In basic education, approximately 3 million children remain out of school and where schooling is available, many children cannot pursue or continue an education due to economic factors, lack of family support, or other barriers associated with poverty. And in 2017, an estimated 50% of all Ethiopian young adults remained unemployed. We are working with partners to provide educational opportunities for some of the most vulnerable and marginalized youth, children and women in Ethiopia. Our work focuses on reducing the barriers that keep many disadvantaged children and youth out of school. Since 2011, Ethiopiaid Canada has supported its partner Hope Enterprises' vocational training program for disadvantaged youth. The program offers training to approximately 100 students each year, in the fields of metal work, industrial machinery and electrical wiring, in carpentry, hospitality and catering. In order to strengthen trainees' entrepreneurial skills, business studies were also incorporated into the training program. All students are provided daily with a nutritious breakfast and lunch. The training is 70% practical and all students are placed on two month apprenticeships, which help many secure permanent jobs upon graduation. Through this program, entrepreneurial skills and self-sufficiency are nurtured to prepare students with the skills necessary for the growing industrial sector in Ethiopia. For a child living with a disability in Ethiopia, access to education is virtually impossible. Since 2013, Ethiopiaid has partnered with Cheshire Services in Harar to expand educational opportunities for economically disadvantaged children with disabilities. This includes providing mobility aids, offering educational subsidies, and creating a more accessible environment. We also support home-based care to children with disabilities. This is achieved through the provision of walking aids as well as rehabilitation activities such as physiotherapy. In this way, children can receive comprehensive treatment, close to their families and in a familiar environment. We also construct structures such as ramps and accessible toilets at schools where students have mobility issues. Cheshire runs an inclusive kindergarten class, where children with physical and developmental disabilities learn alongside their peers without disabilities. Children receive extra educational support where needed, and gain valuable social interaction skills. We offer subsidies to cover the cost of school fees, books, and transportation to older children with disabilities. They may not have been able to attend school when they were younger, due to their disability. Through these programs, we're working to ensure that all children reach their potential. In 2016, Ethiopiaid Canada took investments in women’s education to the next level. In a world of increased access to higher education, we know that young women in less developed countries are falling behind. To equip smart and ambitious women who lack only the means to obtain a higher education, the chance to stand out in an increasingly competitive job market, we partnered with Hope College of Business, Science and Technology in Addis Ababa. With a staff of 40 professors teaching in eight different disciplines, Hope College boasts a student enrollment of 1,100 full time and 300 part-time students. Students obtain diplomas in highly employable areas such as business, technology and social sciences, which are key areas of development supported by the government. Once qualified, Hope College graduates find jobs in government or private sectors quite easily and quickly. In 2016, Ethiopiaid Canada committed to supporting higher education for 10 young women at the College for the full duration of their courses (3 years).